When most people think of Seraphim, they think of angels, but earliest usages of the term refer to serpent demons. From the Petites Heures de Jean de Berry, a 14th-century illuminated manuscript. When most people think of Seraphim, they think of angels, but earliest usages of the term refer to serpent demons. The concept of the serpent as a demon was well known to the Egyptians, Babylonians and Assyrians. In Persian mythology, the serpent Dahaka was the incarnation of the evil spirit Angra Mainyu. The word Seraphim comes from the plural of the Hebrew word ‘saraph’ meaning ‘to burn.’ Initially, it probably referred to the burning sensation and inflammation caused by the venom of a snake bite. In later passages, the word ‘flying’ attached to the term may have referred to the quick movements snakes make. And the Lord sent fiery serpents [literally ‘Seraphim serpents’] among the people, and they bit the people; so that many people of Israel died. In Numbers 21:8, The Lord commands Moses to make a ‘fiery serpent’ (‘a saraph’) and put it atop a pole. When those who were bitten looked upon the serpent, they were cured. Then the LORD said to Moses, “Make a fiery serpent, and set it on a standard; and it shall come about, that everyone who is bitten, when he looks at it, he will live. 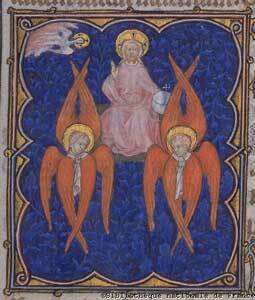 In Isaiah 6:1ff, Seraphim (plural of seraph) are described as creatures with six wings and they no longer retain their serpentine form. In fact, they are described as if they now take the form of humans, with faces, hands and feet, and this is what we usually think of when we hear the term Seraphim. Also of note – Lucifer is often identified as one of the Seraphim. It’s interesting that the serpent of the Garden of Eden may have some connection with the angelic term.